Can I ask the collective for advice. I am just getting into understanding and repairing ( Wooden cases dull metal surfaces of Fork etc.) my very old and beautiful Quantum 6 I just got. I can see that this black knob that engages the clutch for the bottom dial / knob is super stiff. It only rotates maybe 15 degrees or so. 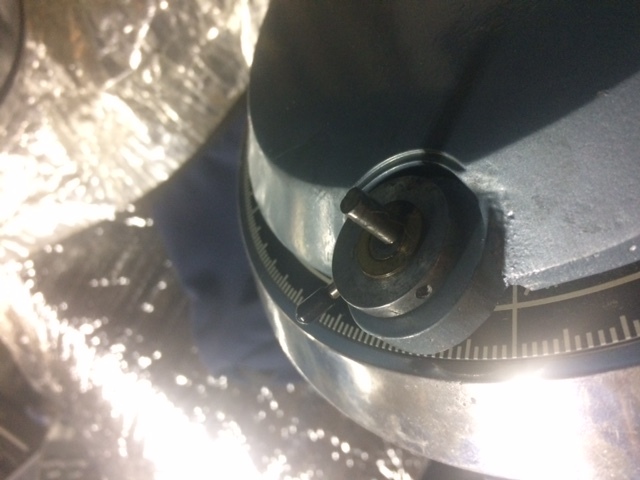 When it is tightened, the larger round knob does rotates the scope. When the black pin is rotated about 15 degrees clockwise it disengages the dial, and the dial does not rotate the fork / scope. 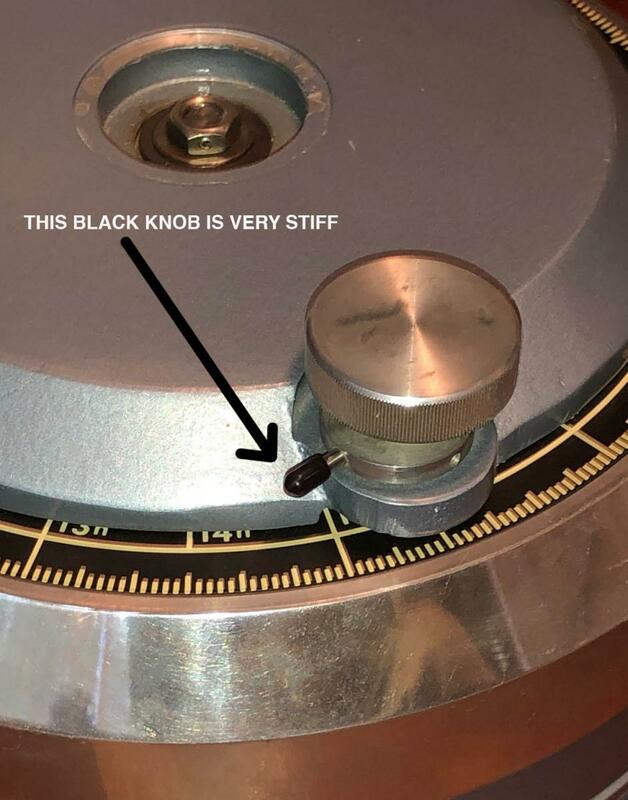 Can I deal with this tight black knob my self? Dare I try to disassemble this fork my self. I DO NOT want to screw it up . Even though the fork looks tired, there are no major defects or dents etc. All the knobs / dials seem to work OK.
Lastly, is there a telescope repair in Los Angeles you know of? I do not want to ship this far away as it costs a fortune and is dangerous. My Q4 was quit stiffer than my Q3.5. I saw some grit between the rotating ring and the R..A. decal and remove as much grit as possible. I also adjusted the lever (by hand) until there was less resistance. Yes it makes sense. I have push it inward towards the center of the base. When I let go of the black knob it rotates outward again and allows the round dial to engage again. Still, it is super stiff and very hard to push. Maybe it is made to be that way? I can see there are 4 different holes that the black knob can be screwed into. maybe I should screw the black knob not,the hole to,the right so there is more latitude to loosen the mechanism. If it can rotate 90 degrees it might be better than a short stroke of just 15 degrees? I wish I knew what normal operation was. My rule of thumb is that if it can be built and serviced it can be disassembled and reassembled by anyone who uses care and attention. So the lever arm (black knob) is hard to push forward? I think mine may have been like that too, but the more I've used it the easier it's become. Like it just had to work out some kinks because the lever wasn't used much. The lever only moves a little forward when pressed too. 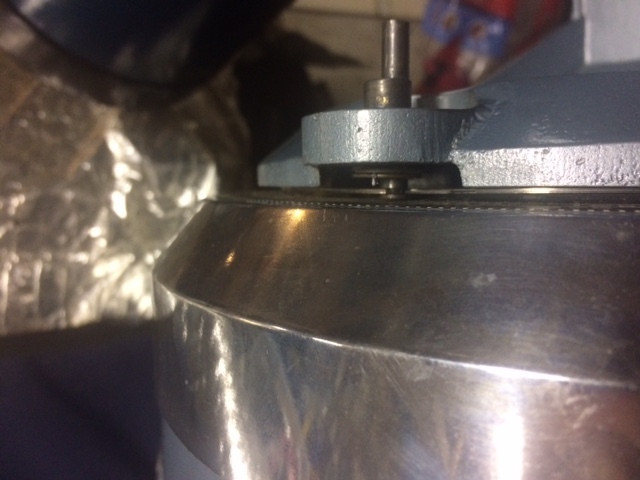 There is a lot of tension on that lever, which I believe it is supposed to have. Does the fork arm base move smoothly when you disengage the large knob? My base rotates really, really smoothly. Edited by TerryWood, 10 February 2019 - 07:55 PM. The scope has not been used for many years, just sat in a den looking cool, but not actually used. I think it needs to be used several times to possibly loosen up. the base does rotate, not buttery smooth but it is not stiff or ferry. Maybe that needs to be used a bit too. the advice to carefully disassemble it is more than I'm willing to do at his point. I hate to spend a fortune to repair my damage I might cause.... we'll see. Keep us posted! I think the first chance you get to turn it toward the Moon you'll be very happy! Taking it out under the stars and use it is probably the best thing you can do for both the Q6 and yourself. 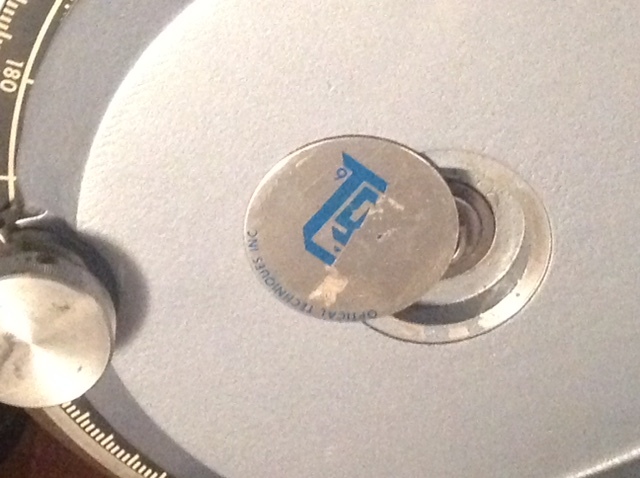 Are you missing the OTI round emblem that is to cover the central bolt on the mount? I think your Q6 will work good. I believe more use will help. Good Luck ! So interesting the comment about the missing OTI emblem. I do have it sitting loose ina plastic bag. It came with the scope and it missing some of its painted emblem - but I got it. now that I know where it goes I will reattach it after I clean up the scope a bit. Thanks for that. The more you use it, the better the scope will become after such a long time of storage. It may need some wearing in once again. Let us know how she does under the stars! I asked about the emblem because I believe I have a spare. B4 Alan Kerro retired from Davro he suggested I buy a few common spares, and an emplem was part of that package,. thats great you have an extra. The one I have included in a plastic baggie is all banged up and missing half of the painted logo. I'll send a photo of it tomorrow. I checked my "stash" today. I have qty 1 extra Q6 emblem and qty 1 Q4 emblem. Both pristine. 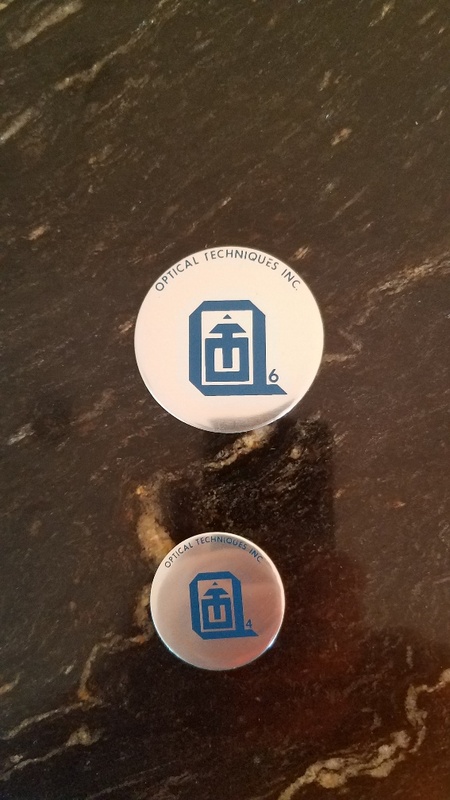 Also qty 1 extra Q6 RA indicator and qty 1 extra Q4 RA indicator. Eric gets the Q6 emblem should he want it. The others are up for grabs ONLY TO PEOPLE WHO DEMONSTRABLY NEED THEM. Just pay for shipping. As far as I'm concerned, its inappropriate to hoard these unobtaneum items if people really need them. I have 1 ea of these for my Q4 and Q6, I'd never need the others. The spirit of generosity is inspiring. I might suggest publishing what you can of dimensions and details to enable future replication. A 300 DPI scan is very helpful. A photo with a ruler is good too. Honestly: Alan at Davro would "accidentally" let stuff fall into boxes on occasion. It would be just wrong to capitalize on that. Bad karma! Good point on the scan and dimensions. I can do that! that is is very generous of you, I'll take it. About how much is shipping? I'll send it via pay pal. In return, I would like to send you one of my photos as a form of thanks. Here is a shot of my emblem. Not exactly pristine. Sure! That is being awfully nice! And may I suggest our PM system to all interested for exchanging further personal contact information? Our ToS do not allow that in the forums. Many years ago my Q6 also had a stiff clutch (black knob). I think all I did was remove the aluminum slow motion knob and use a little 3-in-1 on the clutch ecentric. 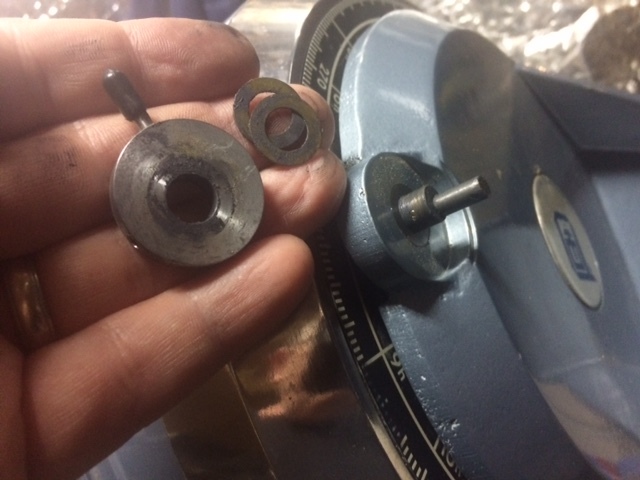 The clutch knob also has a set scew and it seems to me I removed it to lubricate as well. My memory is weak on this though. If you don't want to experiment I can quickly take mine appart for getting you detailed instructions. In any event, I don't remember having to do major surgery to fix mine. Okay, I just went and looked at my Q6. 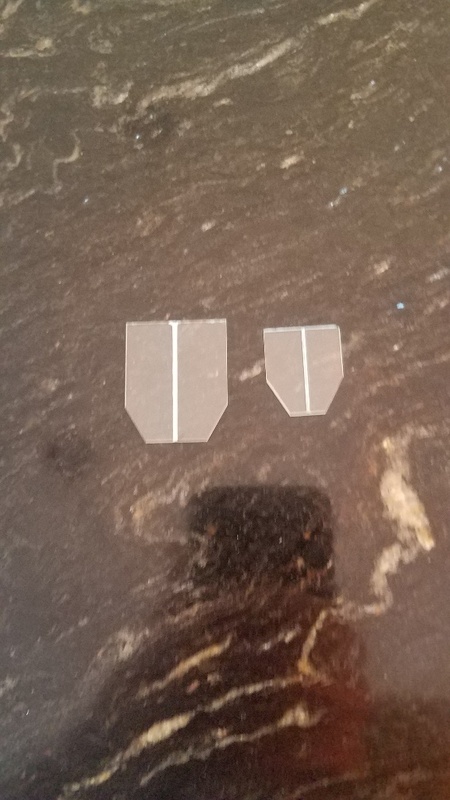 Mine was a little stiff too so I took it apart and relubed it. See pictures that may be upside down if they show up like on my phone. 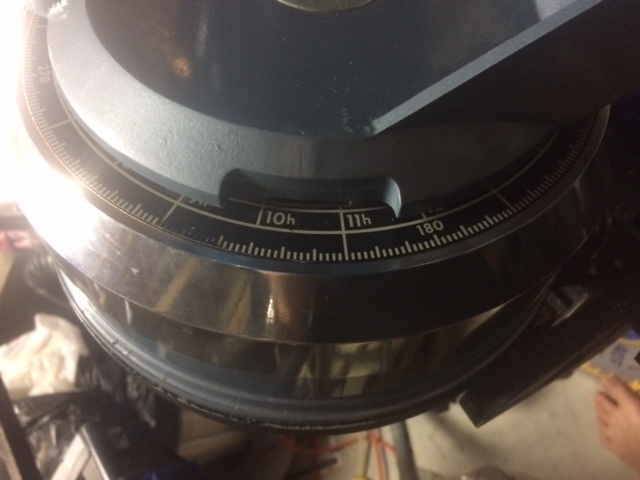 The knob of mine has TWO 5/64" set scews and comes off easy. A couple of brass washers hide under. The clutch knob has again, two set screws, 1/16" . One on mine hides where you can only get to it by pushing the lever in. So do the hidden one first so there is no load on it when you loosen it. Pull the knob straight up. Now you can get to the top of the ecentric and drive shaft. On mine, a little light oil loosened it up. You may have to put the lever back on temporarily to work the oil in. I then just superlubed the washers and put it back together. Put the clutch lever as close to the base so that it still has room to operate. I made the mistake of not and its set screw applied force right to the thin part of the ecentric and caused the slow motion shaft to bind. Good luck if you give it q try. So my last photo was not meant to be there. I meant to PM it to Peter to prove I'm short an RA pointer. I will take that offline with him tomorrow.